Amazing Aztecs is 6 reels and 243 paylines video slot game developed by Microgaming software platform. Total coins for the game is 10 and you can play this slot with a starting 10p per spin to £100 per spin at any Microgaming online casino. Amazing Aztecs can be played across all devices including mobile phones and tablets. The slot offers a jackpot of 100 times of your total bet. As the name suggest, this slot pays tribute to Aztec empire of Mexico from 1300 to 1521 AD. The game features cartoon style symbols, Aztec style orchids, hibiscuses, tiger flowers, marigolds and lilies of the Incas. 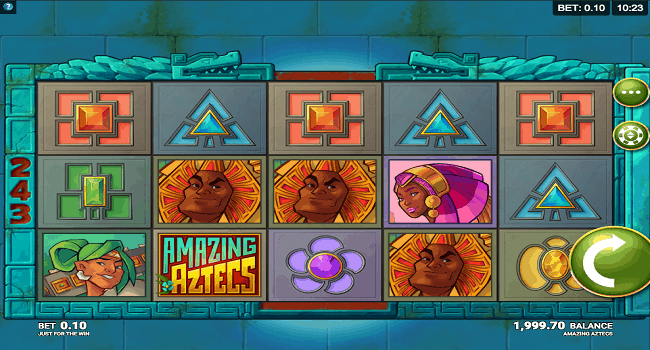 The Amazing Aztecs logo is the most lucrative symbol of this slot game and it will offer you 10x of your total stake if you land 5 of these kinds of symbols across a payline. There than Amazing Aztecs logo there are 4 more characters included in this game and they are the Chief, Shaman, Hunter and princes. When you get or land on a winning combination a Giant Re-Spin feature will be triggered. This particular re-spin feature takes place in with2×2, 3×3 and 4×4 blocks and that will enhance your winning combination. There is a guaranteed win every time whn this happens to a player. Amazing Aztecs slot is a very simple slot and it could give you up to 824 times of your total bet on each spin.